It's anybody's game in the 5th District high school rodeo girls' all-around race after last weekend's third of five circuit stops, this one at Shoshone. Next up: The Carey stop at Blaine County Fairgrounds is Friday, May 11 at 7 p.m. and Saturday, May 12 at 2 p.m. Lights out in breakaway roping, 2010 all-around winner Valene Lickley of Valley had an outstanding 75-point weekend for a season total of 182 points—six better than Wood River's Haillie Taylor (176). At Shoshone, Lickley clocked 3.15-second and 6.790-second breakaway rides for 19 out of 20 points. She ended with double-digit points in each of her events to vault from third to first place in girls' standings. Taylor, the leader after Glenns Ferry and Jerome, kept pace with 15 points in barrel racing and goat tying and 14 in pole bending. But her consistent 51-point weekend couldn't keep pace with Lickley, who added 13 in team roping alone. In Saturday's go-round, Taylor posted a second-place 18.087-second time. She moved past rookie Bailey Gough of Gooding into first place in the season barrel racing standings with 47 points. Gough has 41. Taylor stands second in pole bending, and third in both breakaway and goat tying. However, Taylor has picked up only five points in team roping, while Lickley has 32 on the season and Fox has 23. Rookie contender Kylie Castle of Carey School had a good stop at Shoshone, adding 7 points for a season total of 26. Castle placed fifth in Saturday's barrel racing go-round with a time of 18.819 seconds. Meanwhile, Carey senior Taylor Castle earned 7 points in the same Saturday barrel racing performance with an 18.752-second time at Shoshone. Jared Parke of Gooding, the boys' leader each week, stretched his lead over Brogan Bennett of Gooding from 11 to 24 points. The steer wrestling leader by a wide margin, Parke added 49 points at Shoshone for a total of 130. Bennett has 106. 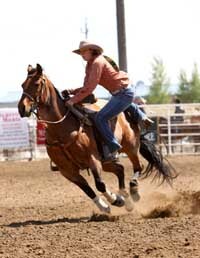 Coming rodeos: May 11-12 at Blaine County Fairgrounds, and the district finals May 25-26 in Gooding.